As I stated in an early post I recently went through and purged my closet…again. I try to purge it at least once a year just to make sure it is cleaned up. The basic idea here is turn all of your hangers around so they hook onto the bar a physically different way. As time goes along you will naturally wear some of the clothes When you hang them up you put them on the hanger bar the same way that you usually do. Wait 3,6,9,12 months. After the time is up go through and get rid of all of the clothes that are still turned around. Obviously if you did the 3 month time period and it is the middle of winter you may not be wearing your summer clothes. What I recommend doing is turning all of the hangers around and then as each season gets done get rid the clothes that you would normally wear during that season. This allows you to feel like you are doing something all year. This idea was brought up by one of my friends who pointed out. I don’t really use hangers but I have a ton of clothes. In this idea you clear a part of a drawer or a space on the floor. To make this example easier I am going to assume you are cleaning out the top drawer in the dresser. As you wear clothes you put them in the top drawer instead of one of the other drawers. Over time you will need more drawers for the clothes you have been wearing. The good part is you have been taking them out of the other drawers so clean out the second drawer from the top and use that as a second “keep” drawer. At the end of 3,6… months you follow the same idea that you did in the turn your hanger around method. Simply try to remember how often you wear something. Honestly I think this is probably the worst method of the 3 but it is the one that I did this time so I thought I should mention it. Shorts – In the last year I had only worn shorts once. As I have gotten older I seem to find myself wearing pants most of the time. So I got rid of all of the shorts except for the pair that I wore last year. Pants – I actually don’t like wearing khakis that much and never wear them, so out they go. Dress pants I have 2 other pairs that I wear 95% of the time so I thought it would be a good idea to get rid of the 3rd pair since I wasn’t using them. The pajama pants I got rid of because I got a new pair for christmas so I got rid of one of the older ones. 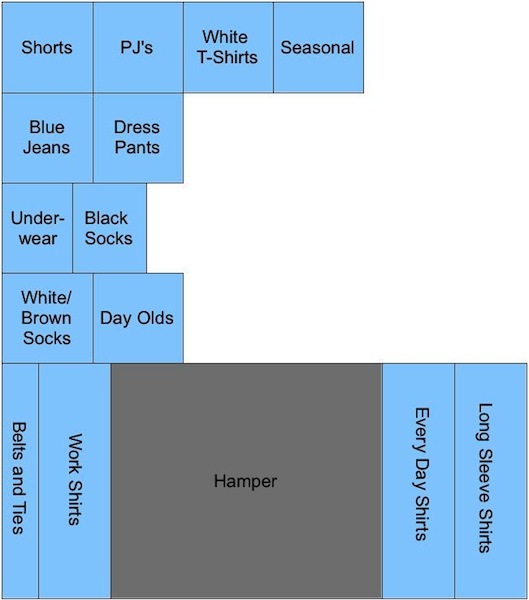 Side Note: One thing that makes it easier to get rid of clothes is to remember a one in one out method. Or if you have a lot of things a one in two out method might be better. If you do things gradually it can make it easier. Shirts – I don’t really like wearing long sleeve shirts. I didn’t have very many when I started this purge but I got rid of about half of what I had left. Short sleeves, I picked ones that I don’t wear very often or had logos/sayings on them that didn’t look professional. Jersey – This one was actually kind of hard for me but I had only worn it once over the last 2 years. The part that made it hard is that my wife actually designed the logo that the hockey team uses. I felt bad getting rid of it. The funny thing was that when I actually asked her if she was ok with me getting rid of it she was completely ok with it. I had held more sentimental value on it than she had. Jackets – The winter coat was one of those huge poofy coats that you can wear when taking trips to the south pole. I had not worn it in over a year so that is why it left. The fleece had been given to me by someone else when they thought I looked cold at a bon fire at their house. They wouldn’t let me give it back. I am assuming they were trying to get rid of it themselves. I am actually surprised it was not gone before now. Normally if it is still in good condition I donate it. 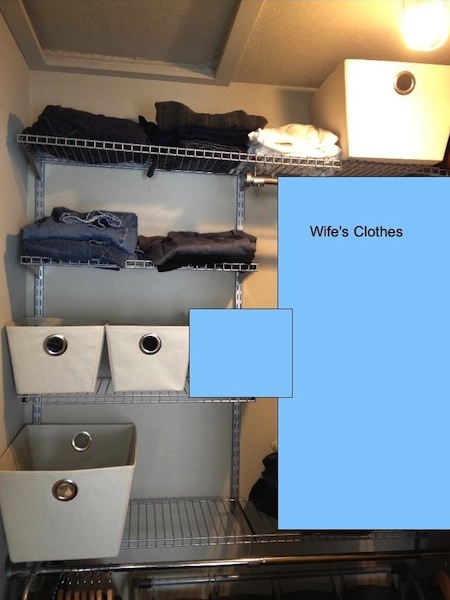 There are many places that would love to have your clothes. To name a few there is Goodwill, Salvation Army, or Love INC I am also sure you can find some local charities that would love to have your old gently used clothes. The Jersey actually got given to a friend of mine that is a much bigger fan of the team than I am and I am happy that I was able to give it to someone that likes it. Ryan Mitchell over at The Tiny Life has an interesting post the other day about some college housing that has been defined as to small. That could be because it is only 94 sq ft. Even though it is small, it is really well laid out. If you think about it how much smaller is this than the average 2 person dorm room. I would not have minded this if it was my own personal space. Think about it , you get a bed, shower, bathroom, sink, desk, and table all in the same 94 sq ft. How many of you had bathrooms in your dorm rooms? I am not sure how much they cost to build per unit in the first place but, the rent was $4400 per year. Unfortunately the school that they were designed for thought that they were to small. :( I am guessing because it would be hard to get around inside of for someone in a wheelchair. To bad though. Would be cool to see them built. Invite people over for a party. Knowing people are coming over always brings out the cleaner in you. You pick up everything that is even slightly out of place. Pick up stray stuff around the house. Get a basket, a bag, or a box and pick up everything that is out of place. Keep track of which items you pick up. If you are always picking up the same things then maybe where you are storing them in the wrong place. Make sure you have a location for everything. If it doesn’t have a home then it will constantly be moving around. My name is Nate. I currently live in West Michigan and work as a Computer Programmer. As I was growing up I was like most Americans and always wanted more. I collected furniture, computers, clothes… and as I was moving around I moved everything with me. Those same themes kept coming up over and over again. I decided to take it as a sign that my sub-concious didn’t want to have the biggest place. My wife and I started looking at smaller houses and ended up finding one that was perfect for us. It is small, has no honey do list (my personal favorite), stylish and comfortable. Our home is about 950 sq ft when my last apartment was 900 sq ft. 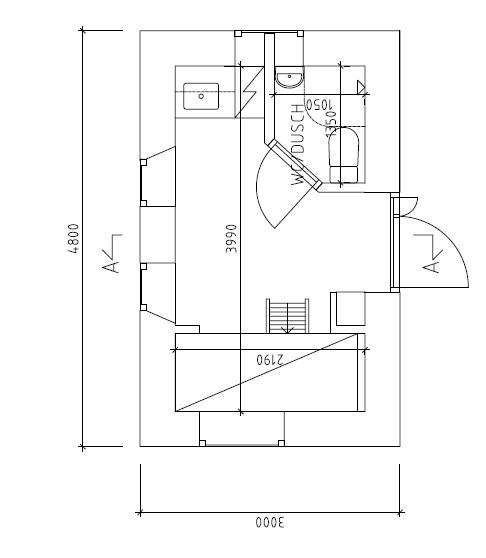 If you look at it as a sq ft / person we went from 906 sq ft / person to 475 sq ft / person. 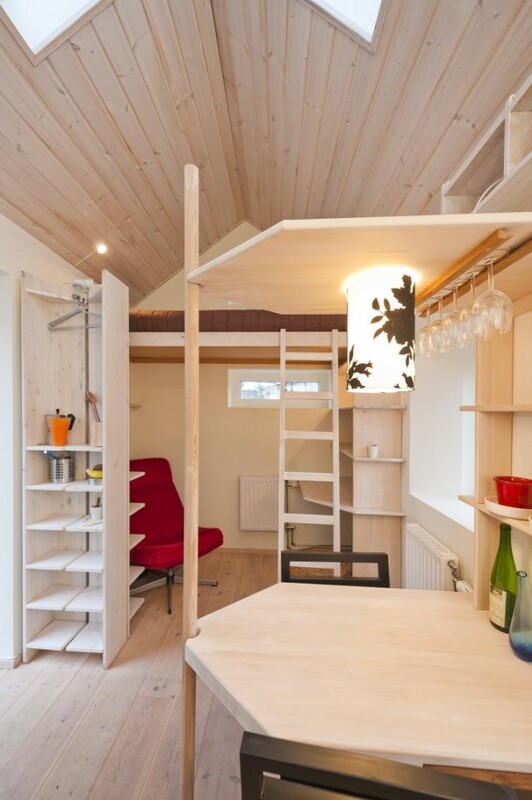 A 425 sq ft / person drop. The funny thing is that we ended up buying all of the furniture from the previous owner. So you know all of that furniture that I had been carefully moving from place to place (8 times since starting college)? It never moved and instead got given away or trashed. We ended up only moving 1 piece into the house and that was only because it had sentimental value to me. I really wish I would have learned to live smaller earlier on as it would have saved me a lot of lugging. At first it did seem a little bit crowded fitting both of our stuff in 1 place and she didn’t even move in until we were married, about 6 months later. But since moving into the house we continue to purge on a regular basis and now the house almost seems big. I hope you have a good idea now for who I am and why I live smaller.